While far too many people in Britain are pondering the question “Should the UK leave the EU?”, our continental neighbours are more concerned with debating the issue of how the European Union should now evolve. Evolve it must, as the prolonged crisis in the eurozone has highlighted that the current methods of governance are no longer fit for purpose. Probably they never were. Instead, there will have to be a form of fiscal and banking union, though that is something Britain is likely to remain detached from for the forseeable future. Last night, at a Federal Trust seminar at Europe House in Westminster, arch-federalist and LibDem MEP for the East of England, Andrew Duff, set out his vision for the future, arguing that the EU’s treaties need to be revised as soon as possible, as the Lisbon Treaty is being stretched to breaking point by the current crisis. 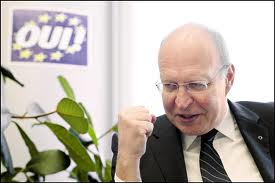 He predicted that there will be a Convention kicking off the new treaty process in the Spring of 2015 (once the European elections are out of the way and a new Commission is in place). 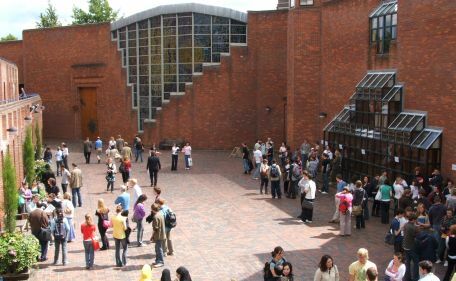 It falls to the federalist movement to draft a new constitutional treaty for a federalist EU, Andrew said — and of course he would normally be part of that, having been intimately involved in preparations for the last draft Constitution, which had to be dropped because of public opposition in several member states. Andrew also once more floated the idea that in future there will need to be a group of MEPs in the European Parliament who are elected from transnational lists. And more controversially, he developed his concept of associate membership of the EU, describing four possible categories: (1) Norway and Switzerland, (2) Serbia and other aspirant member states which still have a lot of changes to make domestically, (3) Turkey, and (4) the UK and any other member state which feels it does not wish to be part of a federal union. This all led to a lively debate; as ever Andrew was thought-provoking and the discussion was far more intelligent than what one hears in the House of Commons or reads in most of the British Press. The European Union is missing an opportunity in not facilitating Turkey’s membership of the EU, according to Rizanur Meral, President of TUSKON, the Confederation of Turkish Businessmen and Industrialists. He was speaking at a fringe meeting of the Congress of the European Liberal Democrats (ELDR) in Dublin this lunchtime and stressed the demographic benefit of Turkish membership for an ageing Europe. Moreover, the Turkish economy is growing: over 8% per annum in 2010 and 2011, and although this is likely to fall back to 3.5% this year that is considerably better than in the current EU member states. Over the past 10 years, per capita income in Turkey has trebled, which means that it is no longer such a poor neighbour either, and it is still seen as something of a model by other countries in the Middle East and North Africa (MENA) region, Mr Meral argued. Somewhat less optimistic was the view put forward by Andrew Duff, LibDem MEP for the East of England and a longstanding member of the European Parliament’s committee relating to Turkey. Andrew bemoaned the fact that the political reform process in Turkey seems to have slowed and declared that probably what was needed was a completely new constitution. 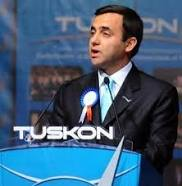 ‘Citizens in Turkey are still treated as if it is their job to serve the State,’ he said, ‘whereas in Europe since the Second World War that assumption has been turned on its head.’ Andrew also proposed that Turkey should be offered a form of associate membership of the EU, as there is no chance in the foreseeable future of full membership, despite Ankara’s application being on the table for so long. When he raised this prospect at a fringe meeting at the LibDems’ autumn conference in Brighton recently, Andrew received a giant metaphorical raspberry from the Turkish Ambassador to the UK, and he appeared to have little support in the room today for the proposition either. Nonetheless, one would be blind to ignore the problems. One chink of hope is that the Irish presidency, which will start on 1 January 2013, has indicated it is willing to open new chapters in the accession negotiations with Turkey — though whether countries such as France, Germany and Austria would agree is another matter. The Liberal Democrat Friends of Turkey hosted an unusually sparky fringe meeting at the party’s Brighton conference today at which Andrew Duff MEP outlined a proposal which he said the European Parliament was working on to offer Turkey a form of (admittedly second class) associate membership of the European Union. 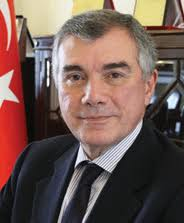 The urbane Turkish Ambassador, Unal Cevikoz, slapped that suggestion down firmly, saying Turkey wanted all or nothing when it came to EU membership. But the two men — and a third panel member, the political analyst Daniel Levy — found more ground for agreement when it came to arguing for closer EU-Turkish cooperation in assisting the progress of the Arab Spring. Turkey has upped the ante in its foreign policy with regard to the MENA (Middle East and North Africa) region, partly because the EU and the West in general have not really done as much as they could to facilitate democratic change and economic cooperation in the southern and eastern Mediterranean. One of the questioners in the audience at today’s fringe meeting rightly highlighted the hypocrisy and double standards that have characterised much of the West’s dealings with the Arabian Gulf states, Israel and Iran. And there was a meeting of minds among the panel members when it came to encouraging a more mature European approach to Iran, rather than seeing it simply through the prism of the country’s nuclear programme. Of course it was not possible in the short space of one hour to formulate much of a coherent strategy for the improvement of the relations between the EU, Turkey and the MENA region but the gathering gave everyone plenty of food for thought. The European Parliament is little understood and in England, at least, much misrepresented. This is largely the fault of the British media, most of which either ignores or lampoons the institution. But many UK politicians — including some MEPs — share the blame. One expects UKIP to be misleading and nasty; after all, they want Britain out of the European Union (though I am sure the UKIP MEPs would be the first to bemoan their consequent loss of salary). But an alarming number of Tories also take part in the ritualistic slagging-off of the EU in general and the Parliament in particular. Three of the worst Conservative offenders in the last parliament, were Daniel Hannan (still there), Roger Helmer and Chris Heaton-Harris; they were apparently known to their fellow MEPs as “The H Block”. That is one of the myriad facts that even a longstanding observer of the European Parliament such as myself picked up from a new book: Europe’s Parliament (John Harper Publishing, £29), by Julian Priestley and Stephen Clark. Julian was an Oxford contemporary of mine, and our paths crossed again when I started covering the then appointed European Parliament in Strasbourg and Luxembourg for Reuters in 1974, when he was a junior official. He rose to become the Parliament’s Secretary General, and it is not difficult to work out which parts of this weighty but accessibly-written tome came from his pen. I particularly relished the description of Andrew Duff (LibDem MEP for the East of England) as an Ayatollah among the group of revolutionary constitutionalists. Inevitably the choice of personalities is somewhat subjective. Nigel Farrage, UKIP’s Leader, gets more than his fair share, whereas Sharon Bowles (the South East LibDem MEP who is sometimes rather grandly described as the most powerful women in European financial circles) doesn’t get a mention. The French and Germans not surprisingly receive full coverage, as they have been so key to the Parliament’s development. 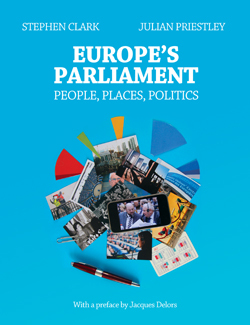 The early part of the book is largely about the three parliamentary sites and their buildings, which I fear will be red rag to the Eurosceptic bulls. Luxembourg now merely houses officials, but there is still a ridiculous and ridiculously expensive moving cricus of MEPs and hangers-on between Brussels and Strasboug each month, despite the valiant efforts of Edward McMillan-Scott and others to press for a Single Seat. That would, alas, require a Treaty change, which can only happen by unanimity; no prizes for guessing which country would block Strasbourg’s demise (though as Priestley and Clark point out, many Germans have a strong attachment to the Alsace city too. The book is probably too hefty to be of much direct use in schools, but certainly it will appeal to politics undergraduates, journalists and politicos, not least aspirant MEPs such as myself. As expected. Martin Schulz of the Socialist Group (S&D) was elected by MEPs to be the new President of the European Parliament today, taking over from former Polish Prime Minister Jerzy Buzek of the centre-right Christian Democrats (EPP). But his majority was not a landslide, despite the traditional stitch-up between the two main political groups in the parliament. Two British challengers, Diana Wallis from the LibDems (and therefore ALDE) and Nirj Deva of the Conservatives (ECR) did pick up quite a a lot of support from disaffected main party MEPs as well as from members of their own minority groups. The system is a farce, and does nothing to enhance the already shaky reputation of the European Parliament amongst the electorate across the EU’s 27 member states. Sir Graham Watson, former ALDE leader and now President of the ELDR (European Liberal Democrats, which also also embraces parties from European states outside the EU) was one of the first to tilt Don Quixote-like at the windmills of the Euro-parliamentary structure and Diana Wallis deserves credit for picking up the baton with panache. 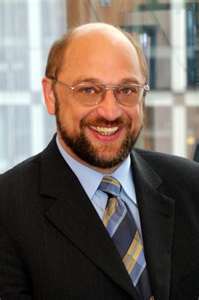 Meanwhile, few people in Britain, other than Euro-political nerds, will have any idea who Martin Schulz is. After all, most of the British electorate cannot name a single one of their own MEPs, so why should they have heard of a German one? But this is a pity, to say the least. The British public is poorly served by domestic media coverage of the European Parliament and its doings, in stark contrast to the citizens of Spain, for example. Anyway, it is worth knowing something about the man who will be presiding over sessions of the Parliament for the next two-and-a-half years. Born in an area where the German, Dutch and Belgian borders meet, Martin Schulz is unusual amongst MEPs in being a bookseller by profession; he ran his own bookshop in Wuerselen from 1982 to 1994. But he was politically motivated from an early age. 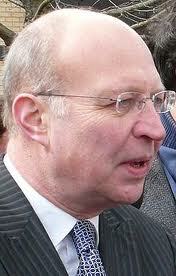 He joined the German Social Democratic Party at the age of 19, and 12 years later, he was elected Mayor of Wuerselen. According to his official European Parliament potted biography, this experience ‘shaped my enthusiasm for Europe and the conviction that I wanted to help build and advance the European project.’ So no doubts there about how the new President wants to further the cause of European integration. 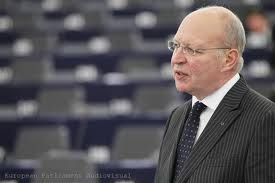 But it will be interesting to see how he handles debates as he is a more fiery character than Jerzy Buzek, who has aptly been described by Andrew Duff MEP as ‘gentlemanly’. A few fireworks might be no bad thing, as they might attract to the Parliament a little more of the attention that it definitely deserves as it accrues more powers and influence in the decision- and law-making processes of the EU. I spent the weekend at a spa hotel outside Algiers at the Second International Solidarity Conference with the Sahraoui people, which drew two or three hundred participants from countries as diverse as Argentina, Australia, Belgium, Brazil, Ethiopia, France, Lebanon, Mexico, Namibia, Russia, South Africa and Tunisia. 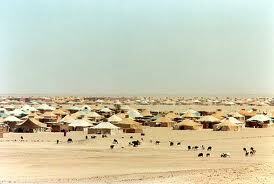 The Algerian TV and other media wee there in force, as the Algerian government has been the firmest friend of the Western Sahara and its independence movement, the Polisario, since Morocco ocupied the phosphate-rich western half of the territory after it ceased to be a Spanish colony. It is often wrongly said that Namibia was the final African country to gain independence, whereas actually the Sahraouis have been struggling for theirs for nearly 40 years — almost as long as the Palestinians. The Sahraoui Arab Democratic Republic (SADR), as the Western Sahara is formally known, is a full member of the African Union and has been recognised by a growing number of countries round the world, though not as yet by Britain. I shall be arguing that Britain should raise the status of the Polisario representation in London to that of an Embassy — as HMG has already done for the Palestinians — which would be an important step towards statehood. 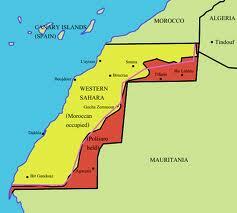 There have been numerous UN resolutions about the Sahraouis’ right to self-determination, but the Moroccans have dragged their feet for many years, thereby preventing a referendum of the people of the territory that is meant to settle the issue one way or the other. Libeal Democrats (and the old Liberal Party before) have had longstanding relations with the Westen Sahara; the late Chris (Earl of) Winchilsea was a particularly active campaigner and organiser of aid to the Sahraoui refugee camps deep in the Algerian desert. And I was pleased that LibDem MEPs — not least Andrew Duff — recently opposed the renewal of the EU fisheries agreement with Morocco because it also covers the waters off the Western Sahara. Indeed, the Coalition government has taken a more progressive line on related issues than its Labour predecessor did, but it still has the task of standing up to France in the European context, as the French are staunch supporters of Morocco and its colonial occupation. But standing up to the French is something Brits have often done rather well in the past, so perhaps on this issue we should return to our traditions! Nick Clegg launched the party’s European manifesto at the Foreign Press Association in Westminster this morning, highlighting the central theme that we are stronger — and safer — together in Europe, but poorer apart. Though few members of the general public read party political manifestos, this is a document the LibDems can be proud of, not just for its slick presentation but more importantly for its content. True to the commitment made by the leadership many months ago, the manifesto really is about European issues, unlike its counterparts in previous European elections. Britain’s Europe Minister, Caroline Flint, caused gasps in the House of Commons yesterday, when she admitted that she had not read all of the Lisbon Treaty. I have often chided New Labour for not making the case for the Treaty stongly enough to the British public, but this really takes the biscuit. For once, I agree with UKIP leader Nigel Farage MEP, who commented, ‘a Minister being in this position of simply not being bothered is staggeringly insulting to the people she is supposed to represent.’ She is clearly not fit for purpose, nor is this increasingly tarnished government. Tony Blair had the most wonderful opportunity to put Britain at the heart of Europe (as he said he wanted to do) after his sweeping victory in 1997. I think he could even have taken the UK into the euro on the crest of his electoral wave. But he flunked it. Gordon Brown has never been as EU-friendly as his predecessor, of course. But it is an appalling indictment of his management of this country’s affairs that he has appointed to the European ministerial portfolio someone who hasn’t even done her homework. How on earth does New Labour think it can ‘sell’ the benefits of the Lisbon Treay to the British people if it carries on like this? Perhaps Ms Flint should be sent off to Brussels for an intenseive course from the leader of the Britsh LibDem MEPs there, the Euro-constitutional expert, Andrew Duff!